The Voice of America (VOA) is a radio, television, and Internet news service that serves as the non-military voice of the United States government by communicating a comprehensive account of America and the world directly to people in other nations. Prohibited by law from broadcasting into the U.S., VOA uses 53 languages while transmitting more than 1,000 hours of news, informational, educational, and cultural programming every week from its Washington, D.C. headquarters to a worldwide audience of about 94 million people. Although the aim of VOA is to promote the long-range interests of Americans, the news service is separated from the U.S. government by a firewall. It does not officially speak for the U.S. government, accepts no special treatment or assistance from American officials or government organizations, and strives for balanced and accurate news reporting. Separate sister agencies of VOA include Radio Free Europe, Radio Free Asia, and the Cuba-focused Radio Martí, with all of these information services overseen and guided by the Broadcasting Board of Governors. 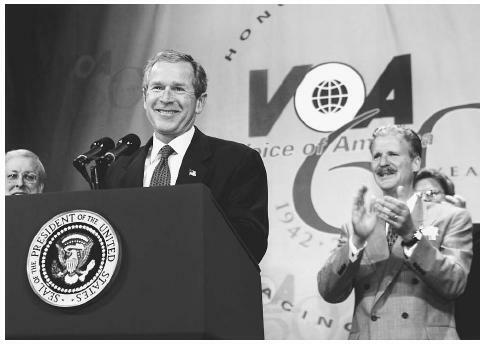 President Bush marks the 60th anniversary of Voice of America, a service that relays news to the world in 53 languages by radio, TV, and the Internet, at a celebration at VOA headquarters in Washington, D.C., in February 2002.
warfare. In 1941, Roosevelt established the U.S. Foreign Information Service (FIS) and the first U.S. governmentsponsored radio broadcast was delivered on February 24, 1942 from New York City to Europe. In June 1942, the government established the Overseas Branch of the Office of War Information and six months later Roosevelt authorized the operation of VOA. The first VOA director, John Houseman, was an actor and playwright who used his dramatic skills to create agitprop. Under Houseman, every tone emanating from a VOA broadcast urged the French to join the resistance against the Nazis. Following the November 1942 Allied invasion of North Africa, VOA shifted its delivery style to calm and neutral news reporting that focused on the impending Allied liberation of Europe rather than the need for resistance. The VOA seemed to be unnecessary once World War II had ended, but the start of the Cold War combined with hostile international broadcasting by the Soviet Union to make the news service into a valuable tool of democratic views. On August 1, 1953, VOA moved from its post-war location within the Department of State to join the newly formed U.S. Information Agency. The number of broadcasts delivered by VOA rose dramatically as the agency responded to the information needs of people behind the Iron Curtain and in politically unstable countries. In 1959, VOA inaugurated Special English, a slow-paced broadcast of simplified English for non-native speakers that was designed to facilitate comprehension. In 1994, VOA entered the television market with a Chinese-language program beamed by satellite. In 1996, VOA television studios were completed and the agency now simulcasts some portions of its programming on both radio and television in twelve languages: Albanian, Arabic, Bosnian, English, Indonesian, Mandarin Chinese, Persian, Russian, Serbian, Spanish, and Ukrainian. It also provides programming to 1200 radio stations around the world. VOA's ability to broadcast consistently reliable and authoritative news to people in closed and war-torn societies makes it a valuable component of American security and intelligence efforts. Although it has occasionally come under attack by political leaders for failing to promote the overthrow of undemocratic governments, critics contend that VOA has succeeded in its mission of delivering unbiased news to a wide audience. Piresein, Robert William. The Voice of America: A History of the International Broadcasting Activities of the United States Government 1940–1962. New York: Arno Press, 1979. Shulman, Holly Cowan. The Voice of America: Propaganda and Democracy 1941–1945. Madison: The University of Wisconsin Press, 1990. Voice of America. "About VOA." February 1, 2003. < http://www.voa.gov/index.cfm > (February 1, 2003).